To create a relay team, follow the below steps. You can have SwimOffice attempt to build the best teams for you using Auto Find or Add NT Relays, or you can build them yourself using Manual Add. When you want SwimOffice to automatically build a relay team, you need at least four swimmers with an individual time. For example, in a 400 free relay you need four swimmers with a 100 free time. Go to your Events or Calendar page. Click Edit Commitment button below the desired event. Click the Auto Find link appearing next to the desired Relay. This will take you to the “Find Best Relay Teams” screen. If it's a free relay you can select the Leg Order Logic. If it's a mixed gender relay you can select the Mixed Relay Option (2 Females + 2 Males, or Any Combination of Genders). Click Add at the bottom. Enter your filters and click Search or click Display ALL Qualifying Members. Check the boxes next to the athletes you wish to exclude. Click Exclude Athlete(s) from this Relay. You can repeat steps a-d to exclude more athletes. If you made any exclusion mistakes, click desired athlete and click Remove. Selections you make will be saved and appear again from relay to relay. This will generate the best relay teams available based on the parameters selected. If no athletes appear, that means there aren't at least four athletes with prior times for that event and you will need to use either Manual Add or Add NT Relays instead (see below). 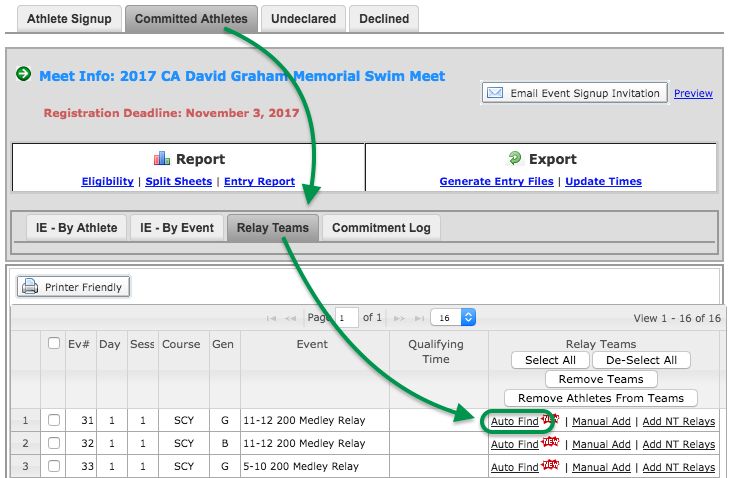 Select the team you wish to add, click Add Selected Relay Teams, click OK to confirm, and it will populate the athlete leg assignments. After building the teams, you may select one or more teams and click Remove Athletes From Teams to simply have an entry time without athletes. If you don't have enough athletes with prior times in order for Auto Find to work, you can use Add NT Relays to automatically build relay teams with swimmers who have no times. It will automatically pick swimmers from oldest to youngest for each team. If you want to pick them yourself, see Manual Add below. Click Add NT Relays to the right of desired relay. Enter the number of relay teams you want to build. 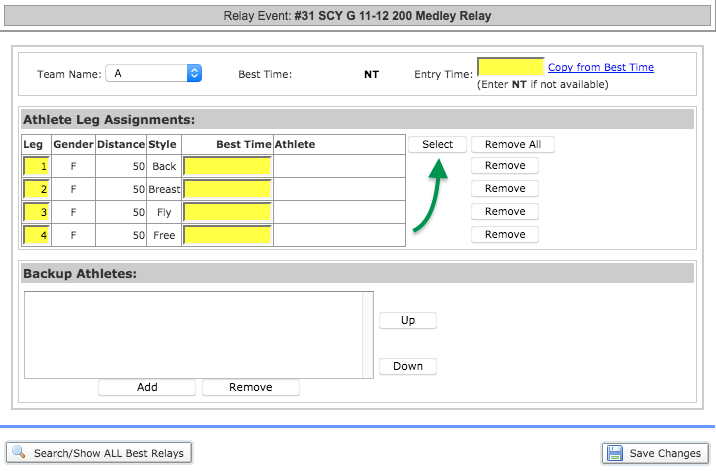 If you want to build relay teams with swimmers, leave the drop down set to Add NT Swimmers. If you want to create empty relay teams with no swimmers so you can deck enter them, change the drop down to Leave Blank. 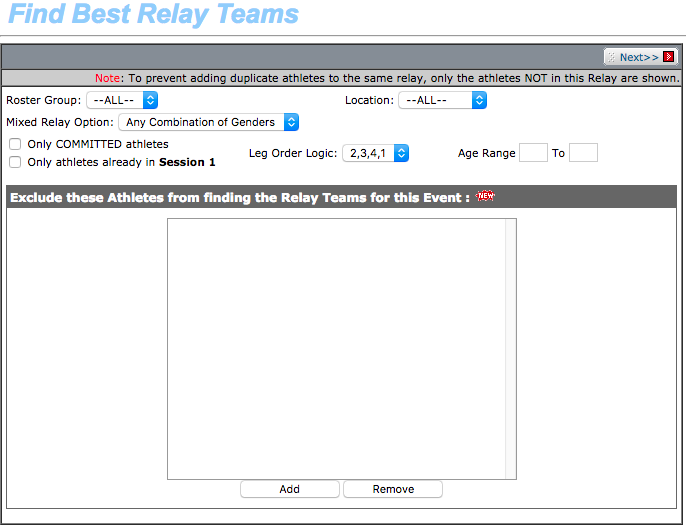 Optionally check the boxes to only search for committed athletes and/or athletes in the relay’s session. 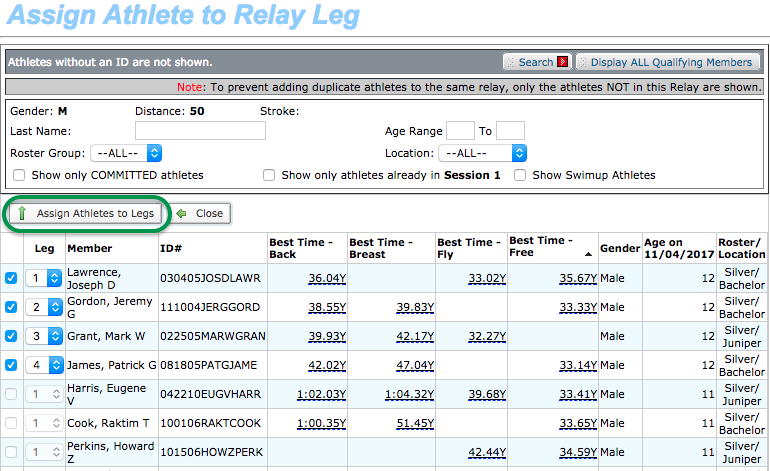 Use Manual Add if Auto Find doesn't work due to not enough athletes having prior times in that relay. Click the Manual Add link to the right of the desired leg of the relay. This will bring you to the “Relay Team Edit” screen. Click Select in the Athlete Leg Assignments section. From here you will see all athletes who qualify for the event. You may optionally set filters at the top and click Search to narrow down the list. Click the checkbox next to the names of the desired athlete for each leg. The leg number will automatically increase with each selection. In the case of medley relays like in the screenshot above, make sure to choose legs in the proper order (back, breast, fly, free). As you choose one leg, best times for the next leg will automatically sort from fastest to slowest to make selection faster. Click Assign Athletes to Legs button when finished. You may click Remove All to remove all four athletes so as to be left with an entry time only. You may optionally add backup athletes by clicking Add below Backup Athletes.